Every two to three hours, Madison resident Gary Storck inhales marijuana to relieve the symptoms of glaucoma. Storck is a leading advocate of legalizing marijuana for medical use in Wisconsin. He co-founded the group, Is My Medicine Legal Yet?, and he writes the Cannabadger blog, which tracks proposals to legalize marijuana in Wisconsin. He is seen in his apartment on March 20, 2019. 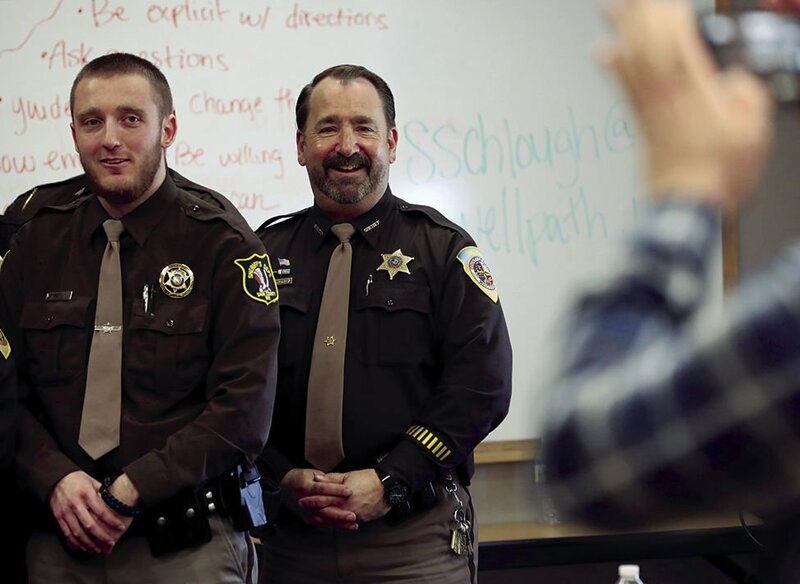 Dane County Sheriff Dave Mahoney greets officers during a Crisis Intervention Training graduation ceremony at the Dane County Law Enforcement Training Center in Waunakee on March 15, 2019. The Democratic sheriff says he favors decriminalizing possession of small amounts of marijuana, as Dane County already has done, and legalizing cannabis for medical uses. But he opposes full legalization until more studies are done about its effects in other states. Alan Robinson, executive director of the Wisconsin chapter of the National Organization for the Reform of Marijuana Laws (NORML), meets with state Sen. Patrick Testin, R-Stevens Point, and his aide Matt Wimmer on Feb. 12, 2019. Testin favors legalizing medicinal cannabis in Wisconsin. But many Republican lawmakers, Robinson says, oppose legalization. State Rep. Melissa Sargent, D-Madison, introduced bills to legalize marijuana in Wisconsin each of the past three legislative sessions. Sargent says she has heard from many constituents of the benefits of using marijuana and the harm of marijuana-related arrests and convictions. She is seen at the University of Wisconsin-Madison on Jan. 31, 2019. Overall, the medical use of cannabis is legal in 33 states, along with the District of Columbia and several U.S. territories. Recreational use is legal in 10 of those states plus D.C. A legalization push in New Jersey, which is controlled by Democrats, recently failed after lawmakers could not reach consensus . Assembly Speaker Robin Vos, R-Rochester, opposes most of Evers’ plan. The governor’s proposal “makes it easier to get recreational marijuana and provides a pathway to full legalization, which I do not support. I’m open to medical marijuana when it’s prescribed by a doctor but it has to be done in a targeted way without allowing recreational use,” Vos said in a statement. This story was produced as part of an investigative reporting class in the University of Wisconsin-Madison School of Journalism and Mass Communication under the direction of Dee J. Hall, the Wisconsin Center for Investigative Journalism’s managing editor. The Center’s collaborations with journalism students are funded in part by the Ira and Ineva Reilly Baldwin Wisconsin Idea Endowment at UW-Madison. The nonprofit Center (www.WisconsinWatch.org) collaborates with Wisconsin Public Radio, Wisconsin Public Television, other news media and the UW-Madison School of Journalism and Mass Communication. All works created, published, posted or disseminated by the Center do not necessarily reflect the views or opinions of UW-Madison or any of its affiliates.